Barack Obama began his presidency with a bold progressive vision for the country. Though much of his agenda was implemented, he faced unprecedented opposition. Obama's push for a moderate climate-change bill (similar to the one he had co-sponsored with John McCain only a few years earlier) was crushed by Republicans. In other policy negotiations, the Republican Party took increasingly extreme steps to extract concessions. During budget negotiations, for example, Republicans refused to accept an equal mix of budget cuts and tax hikes, instead demanding that the budget gap be filled entirely by way of spending reductions. Far from representing just another episode in the story of polarization between the parties’ respective bases, we find evidence that the unprecedented opposition to Obama’s agenda was driven by the extreme demands of wealthy donors, particularly within the Republican Party. Our new extensive study of the attitudes and demographics of donors, "Whose Voice, Whose Choice?" illustrates that donors are overwhelmingly wealthy and much more supportive of austerity than is the general public. 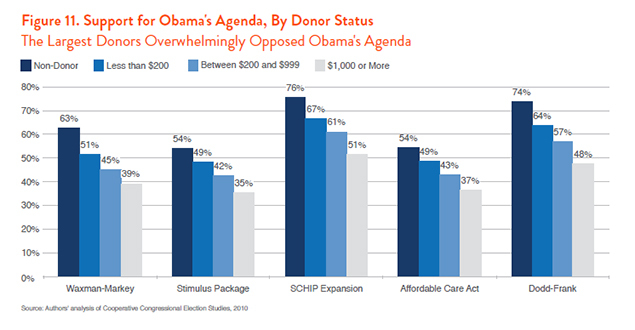 Donors are also more likely to oppose Obama’s progressive agenda than non-donors. Of critical importance, large Republican donors hold extreme attitudes far to the right of smaller Republican donors and Republican non-donors. In contrast, the attitudes of large Democratic donors are much closer to those of smaller donors and non-donors in the Democratic camp. These policy preferences sway the overall posture of our political debate. 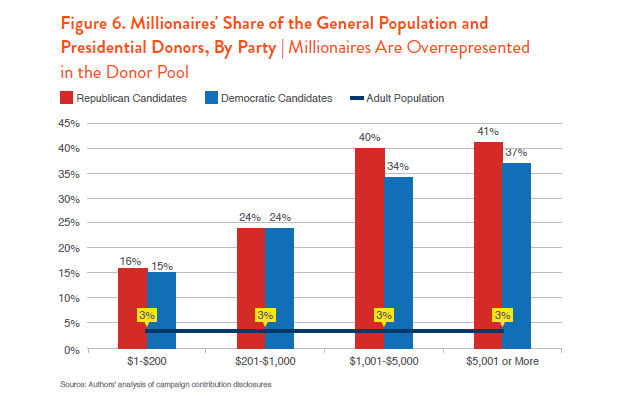 The donor pools for both Republicans and Democrats, in both presidential and congressional elections, are dominated by the wealthy. Millionaires make up a mere 3 percent of the population, but nearly half of all congressional donors contributing more than $10,000 are millionaires. Fully 25 percent of Democratic and 27 percent of Republican donors in our sample were millionaires. Millionaires were evenly divided between the parties: Among those contributing more than $200, 51 percent contributed to Republicans and 49 percent to Democrats. In a cumulative sample, 51 percent of donors with an income over $150,000 identified as Democrats, compared to 43 percent who identified as Republicans (and 7 percent who said they were independent). In the 2016 election, during the period from January of 2015 through July of 2016, 42 percent of the money raised by Hillary Clinton, and 27 percent of the money raised by Donald Trump, came from millionaires. One-third of the money raised by both candidates came from Americans with a net worth between $300,000 and $1 million. Both campaigns relied on big donors. Forty-two percent of the money Trump raised came from donations of $5,000 or more, compared to 29 percent of the money that Clinton raised (this only includes contributions of $200 or more, which are required to be reported). How might this affect policy? Consistently, donors are much more skeptical of government intervention and more supportive of domestic spending cuts. When looking at major redistributive policies such as the Waxman-Markey bill (comprehensive climate-change legislation), the financial stimulus package, the SCHIP expansion (the State Children’s Health Insurance Program), the Affordable Care Act and Dodd-Frank (a financial regulatory bill), donors hold more conservative positions than non-donors. Furthermore, opposition to each of these measures was even more intense among the largest donors. If the largest donors (those giving more than $1,000) had had their way, only the SCHIP expansion would have been enacted. This polarization is even more pronounced when looking at the core debates that dominated the end of Obama’s first term and the beginning of his second: austerity and taxes. These issues are particularly informative because they directly pit the interest of wealthier Americans in lower taxes against those of working- and middle-income Americans in the maintenance of social spending programs. There were three prominent policy proposals related to these issues: Bowles-Simpson, a compromise budget package that would have made cuts to Social Security, Medicare, Medicaid and Defense, as well as eliminating many tax breaks; House Speaker Paul Ryan's budget proposals, which would have slashed domestic spending; and a full extension of the George W. Bush-era tax cuts, which would have dramatically enriched the wealthy. Elite Republican donors are far more extreme than Republican non-donors. While a third of Republican non-donors support the Ryan budget and the Bush tax cuts, 59 percent of Republican elite donors support the Ryan budget, and 72 percent support the Bush tax cuts. Non-donors largely opposed Bowles-Simpson, with 40 percent in support, while 59 percent of elite donors supported it. The uncompromising position Republicans assumed on debt matters primarily reflected the preferences of large donors, rather than Republican voters more generally. Why does this matter? There is increasing evidence that politicians are more responsive to donors than to voters or party members in general. 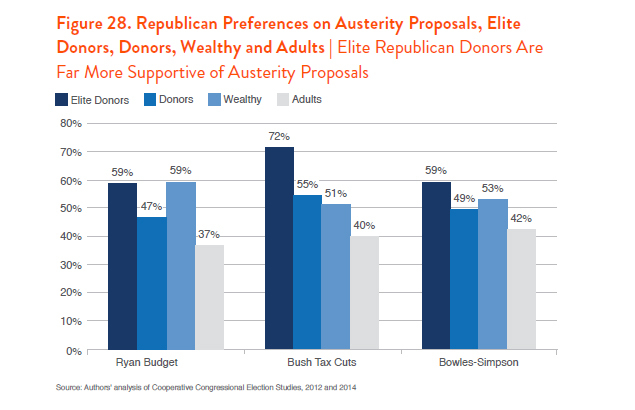 The push for austerity does not come from average Americans, but from powerful donors. Economic and political inequality are self-reinforcing trends: The rich use their increasing wealth to influence the political system, and they overwhelmingly prefer policies that limit the influence of government in society. Though the voice of the donor class is disparate, it speaks with an accent -- and prefers policies that will further increase economic inequality. Note: We used multiple sources for our research. First we matched Federal Election Commission data to Catalist to extract demographic donors for the 2012 and 2016 presidential elections, as well as for the 2012 and 2014 congressional elections. Second, we examined Cooperative Congressional Election Studies (CCES) data to obtain the preferences of donors. Each CCES survey includes more than 50,000 respondents, making it ideal to study donors. When possible, we combined CCES surveys to obtain a larger sample. Finally, we combined four CCES surveys and then weighted the sample using Catalist data to obtain a representative sample of the largest donors (those who gave $5,000 or more), whom we define as "elite donors."